The Hamburg, Germany-based shipping line intends to convert one of their large vessels from traditional oil burn to Liquid Natural Gas use. Others no older that 6 or 7 years could follow. The pilot project, scheduled to be accomplished within 2019, is part of their policy for greener shipping demanded by the International Maritime Organisation (IMO) in their 2020 scheme, including the sharp reduction in the sulphur content of fuel oil. Details were tabled on Monday (Oct 17) by experts at the company’s headquarters located in downtown Hamburg. Are the advantages of the LNG conversion outweighing the disadvantages? This is the 1-billion-euro question that might be finally answered only by 2022 or even later, when forerunner H-L and potential LNG followers might be able to draw a balance if the high initial spent in LNG shipping, including the conversion of deep-sea vessels, investments in supply barges and ground infrastructure have paid off and became new standard in ocean shipping. In the case of ‘Sajir’, a 15,000 TEU vessel built in 2014 that has been selected by H-L to become the company’s guinea pig for LNG conversion, the expenditure of an estimated US$30 million for the technical adjustment is basically guaranteed by the company’s top deck. However, many other issues are still pending final decision, said Herr von Berlepsch. In the same breath he expressed his confidence that “in the months ahead we will successfully overcome all hurdles.” If so, dozens of other ships could eventually follow, if no older than 6 to 7 years to fully compensate the high investments. In addition to this, the company announced it would equip two 13,000 TEU vessels with Exhaust Gas Cleaning Systems (EGCS), also schedule for 2019, to make sure they have thoroughly evaluated different fleet options to comply to the IMO2020 regulation on low sulphur fuel. What makes the pro and cons of the project even more unpredictable is the fact that in contrast to traditional fuel that varies in price only by some cents at oil bunker sites around the world, the price differences in gas supply are immense. “There is yet not an existing world market for LNG, so high price differentials are not leveled out,” stated fleet manager von Berlepsch. Currently, only Singapore and Rotterdam enable shipping lines operating on routes between Far East and Europe to bunker LNG at comparable costs – mas o menos. Coming back to H-L’s ‘Sajir’ vessel, it will be equipped with gas tanks allowing it to bunker 6,000 cubic meters of natural gas. “This volume suffices to cover three quarters of a roundtrip from Europe to Far East and back,” he says. Since LNG burning reduces greenhouse gas emissions remarkably compared to crude oil, H-L becomes also a trendsetter in climate protection matters once the converted ‘Sajir’ is ocean going again. 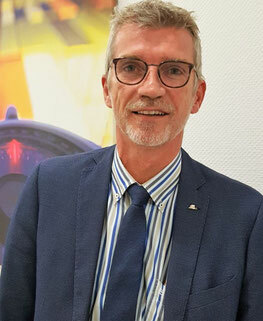 This aim is in full accord with the company’s general policy on emission reductions, as emphasized by Joerg Erdmann, Senior Director Sustainability and Corporate Development. In this respect, complying with or even undercutting IMO’s sulphur limits set for 2020 has become a key target standing on top of the shipping line’s agenda. While today, sulphur emissions caused by marine fuels can amount to 3.5 percent, this will be limited to 0.5 percent and even 0.1 percent in coastal areas around North America and both the North Sea and the Baltic Sea in European waters as of 1 January 2020. However, environmental improvements are costly. Hapag-Lloyd speaks of a tsunami of US$60 billion the world’s major shipping lines will have to spend to comply with the new sulphur regulatory framework set by the IMO and agreed by their 173-member states. According to manager Erdmann, the industry has basically two options, leaving some short-term technical adjustments aside: either they start using low sulphur fuels or invest in new technologies for burning alternative fuels such as LNG. The latter option however, has yet to be thoroughly tested in practice. But no matter if A or B, costs will go up, because compliant fuels as well as investments into new technologies and energies will turn out to be expensive at the end of the day. In the case of H-L, the management estimates additional initial expenditures in the region of US$1bn-plus per year in the first couple of years after the introduction of the new IMO scheme. Their calculation is based on the assumption that the spread between High Sulphur Fuel Oil (HSFO) and its cleaner variant Low Sulphur Fuel Oil (LSFO) will be US$250 per metric ton at the initial phase. To compensate for these additional expenditures caused by higher fuel prices, H-L announced to introduce a “very transparent and easy understanding” (Erdmann) Marine Fuel Recovery mechanism (MFR) to assure payback. 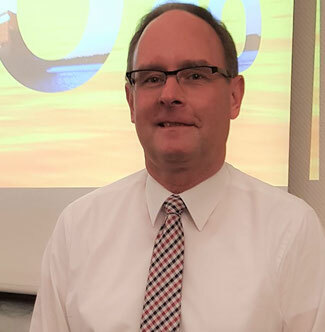 “We hope that our customers accept this price hike and support this way our greener shipping policy,” Mr Erdmann concluded his presentation on sustainability. The transport industry, be it trucks, vessels, aircraft or other modes of commercial conveyance accounts for 12 percent of global greenhouse gas emissions, of which the 50,000 ocean-going vessels contribute between 2.5 to 3 percent.